Recently, Muammar Gaddafi stated that “There are signs that Allah will grant victory to Islam in Europe without sword, without gun, without conquest. We don’t need terrorists, we don’t need homicide bombers. 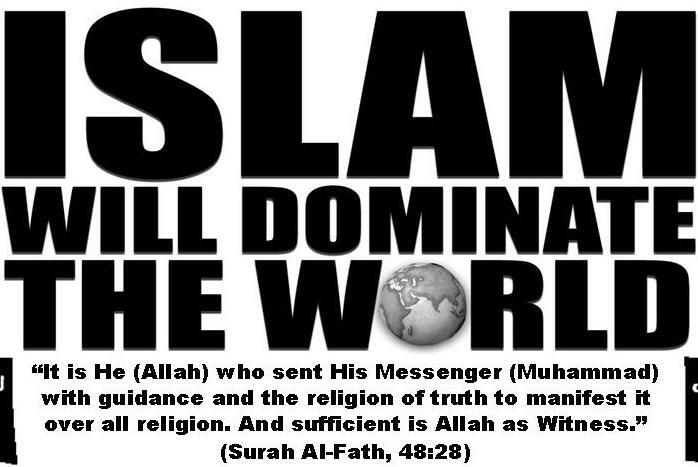 The 50 plus million Muslims (in Europe) will turn it into the Muslim Continent within a few decades.” Irrespective of his summersaults in global politics, he could be right this time. The picture gets clearer if one looks at various research works on demographic changes of western countries in relation to the Muslim immigration and their fertility rate. The average Fertility Rate per family amongst the westerners is 1.65 as compared to the Muslims’ which is 8.1. An interesting picture emerges when this is translated into demographic change. According to studies, it is known that in order for a culture to maintain itself for over 25 years, it has to keep a Fertility Rate of 2.11 children per family. Anything less than that would mean a decline in the culture. At the rate of 1.9, the reverse becomes difficult and it takes 80-100 years to correct itself. At 1.3 or less the reversal becomes impossible. Keeping these figures in mind, let us study the culture growth rates of certain western countries. The figures of 2007 show that; in France, the Fertility Rate was 1.8; in England it was 1.6; in Greece 1.3; Germany 1.3; Italy 1.2; Spain 1.1; and in EU as a whole with 31 countries, it was 1.38. These figures are indicative of a change in the demography of Europe in a few years. In other words; the European culture as we know it will cease to exist in the coming decades. Remember that we are talking of culture not the population which has not declined because of immigration. Statistics show that since 1990 over 90% of immigration was from the Muslim countries. As a result of this change; in France 30% of children age 20 years and below are Muslims. In big cities such as Paris and Marseille, the ratio goes up to 45%. In southern France there are more Mosques than churches. The situation in UK is not much different either. In last 30 years, the Muslim population there has raised from 82,000 to 2.5 Millions, which is a 30 fold increase. There are over 1000 mosques, many of which were converted from churches. The situation remains identical in other major countries of Europe. For example, in the Netherland, 5% newborns are Muslims and in next the 15 years half of the population will be Muslims. Keeping the demographic decline in view, the Germen government reported that, “The fall in the (German) population can no longer be stopped. Its downward spiral is no longer reversible.” It further stated, “It will be a Muslim state by the year 2050”. In Belgium, 50% newborns are Muslims and reportedly its Muslim population is around 25%. Its government recently announced that one third of all European children will be born to Muslims families by 2025. As a result of the high growth rate, the present 52 Million Muslims in Europe will reach to 104 millions in 20 years. It is the same story in Russia. There are 23 million Muslims living in that country which ratios 1:5. It is calculated that soon 40 % of Russian army will be Muslims. In Canada the FR is 1.6 against the required rate of 2.11 causing a gradual decline in non Muslim population. Because of lenient immigration policies; from 2001 to 2006 the population increased by 1.6 million out of which 1.2 million were Muslim immigrants shrinking the national ratio between Muslims and non-Muslims. In the USA, until recently, the FR was 1.6. It increased to 2.11 with the Latino influx but still fell short of the required number to sustain culture. Against this shortfall, the Muslim population in America rose from 100,000 in 1970 to 9,000,000 (9 million) in 2008. What will happen in the coming few decades, is anybody’s guess. Four years ago, a meeting of 24 countries from OIC was held in Chicago. It’s communiqué mentioned that,” we must prepare ourselves for the reality that in 30 years there will be 50 million Muslims living in America” That alarmed the Evangelicals and the Catholic Church. The church recently confessed that Islam surpassed their membership numbers and with the current rate of growth, in 5-7 years it will be dominant religion of the world. These are statistical facts, which portray the likely picture of Islam on the world map. And this makes the radical Christians and Jews worry to the core. As a result, they put their centuries-old rivalry on the side and came up with ‘Judeo-Christian Fraternity’ in recent years to counter the threat jointly. The Muslims should understand their concerns and put themselves in their shoes as to what would have been their response if the growth scale was reversed. With one pretext or another, the right wingers in Judeo-Christianity have been struggling to diminish Muslims in more ways than one in the last few decades. Their struggle took various forms and shapes such as social, cultural, tribal, racial and religious. They did it with apparent designs of pursuing justice without being perceived as grievance. Having total control over world media they have been successful to a large extent but not enough to reverse the demographic trends. Wars break out between Muslim countries where weapons of mass destruction supplied by the west are used. Muslims take up arms against each other on the bases of sectarianism, ethnicity and even language. Disastrous diseases are spread by artificially creating fatal viruses; or contaminating certain vaccines to spread lethal diseases. Some serious researchers believe that this venue was tried through Small Pox vaccination in 1970s and 1980s. Some blame spread of AIDS to a suspect vaccine program involving Simian Immunodeficiency Virus found in the sooty mangabey (known as the White-collared monkey), which is indigenous to western Africa. Spread poverty to lethal levels in the third world countries with high percentage of Muslims. Concentrating and improving on education especially in science and technology. Modernising the religious education in Madrisa making English and science compulsory subjects. Stop killing each other and the followers of other religions. Banning hate literature and encouraging fraternal material in cultural, social and religious fields. Educating the Muslim public through Friday congregations on how to live in harmony with tolerance and understanding. The time is on the side of Muslims. All they need to do is to wait with compassion and patience and not to become tools in the hands of their enemies. Very soon, the world demographic picture is going to change in favour of Muslims, Insha’Allh.